In 1932 a board was found in a crannog (lake dwelling) in Ireland. It contained a 7 X 7 grid of holes, and was decorated with designs used in the 10th century. 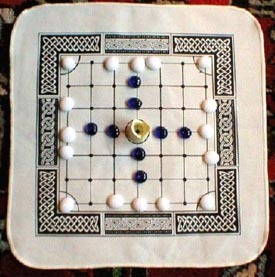 Many scholars believed it to be a Fidchell (also spelled Fithcheal, or Fitchneal) or "Brandubh" game mentioned in early Irish legends, and related to Scandinavian Tafl games. These were the games of choice in Northern Europe prior to the introduction of Chess. The defenders win if the king escapes to the edge of the board, and the attackers win by surrounding the king.4 different game variations included in the rules. The set also includes a simulated sheep knucklebone for use as dice for the Welsh variation.